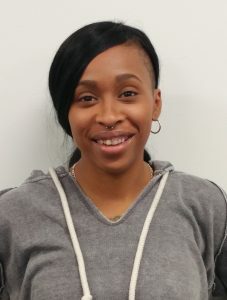 Because “CELEBRATION” is one of our core values here at Horizon Goodwill Industries, we would like to take a moment to celebrate one of our own, Olivia Bowens, E-Commerce Agent. Olivia has been with Horizon Goodwill since December of 2016. Before her Goodwill journey began, Olivia dealt with barriers that were keeping her from achieving her goals. Born and raised in Frederick, MD, Olivia’s family tree was poisoned with addiction throughout her childhood. She then faced her own battles with addiction and crime, ultimately leading to her incarceration in 2014. Olivia reached her breaking point and knew she needed to get back on the road to sobriety and success. Olivia entered “Project 103” through the Frederick County Detention Center, which is a sobriety and substance abuse program. Before her release from incarceration in 2015, Olivia was offered a spot in the “Lasting Change” program to help her transition out of incarceration and her old patterns of addiction. Fast forward to 2018: Olivia is in the last phase of the “Lasting Change” program; has been sober for over two years and counting; has obtained her own apartment; has recently started cosmetology school; and has been promoted from part time to full time. When asked where she sees herself in five years, Olivia said, “I hope to be done with school, still working for Goodwill and practicing cosmetology on the side. I also hope to have a family of my own.” Aside from working for Goodwill and pursuing her cosmetology degree, Olivia enjoys cheerleading, shopping, swimming, going to the beach, traveling, and riding rollercoasters. Olivia came to Hagerstown with no license and no desire to change her situation. She didn’t have a vehicle, lacked confidence in herself and was reluctant to smile. She now has a driver’s license, a vehicle, a new smile with a million reasons to flash it! She is very excited to see where the road of life takes her, and we at Horizon Goodwill Industries look forward to celebrating her successes in the future.